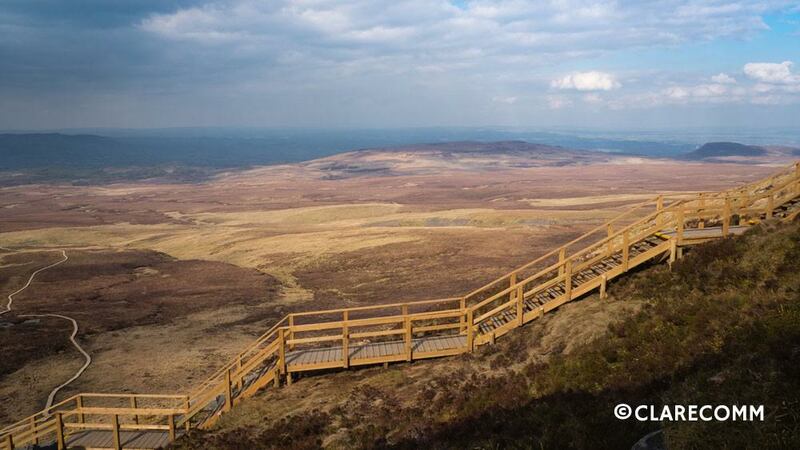 Fermanagh’s Great Wall: 36 flights of steps to the top of Cuilcagh Mountain. A new boardwalk, already dubbed by locals as Fermanagh’s “great wall” has recently been completed on Cuilcagh Mountain in Co. Fermanagh. The project began in the summer of 2014 with collaboration from local landowners, the Northern Ireland Environment Agency and Fermanagh District Council with the aim of preserving the environment in the area. 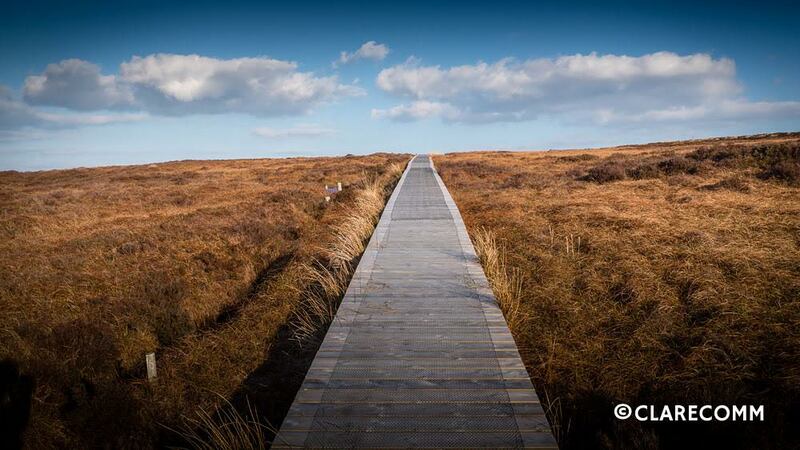 The boardwalk, which cost over £250,000¹ stretches over 1.5Kms of bogland to the top of Co. Fermanagh’s and Co. Cavan’s highest point – Cuilcagh Mountain. In my opinion the way the boardwalk makes the mountain look is purely subjective; some may think it takes away from the beauty, others may feel it adds to it. The bogland in the local area is designated as a Special Area of Conservation (SAC), and an Area of Special Scientific Interest (ASSI) site, which is why special efforts have been made with the construction of this boardwalk, to ensure the plant and wildlife is not disturbed by walkers. Some are already hailing the project a success, claiming that more walkers will now visit the area to climb the 665 metre mountain, boosting tourism and generating money in the local economy. Not everyone has positive feedback though, others have commented that the boardwalk “..kind of defeats the purpose of hill walking” and “..destroys the look of the place“. In my opinion the way the boardwalk makes the mountain look is purely subjective; some may think it takes away from the beauty, others may feel it adds to it. Of course it’s not going to look as natural or wild as it would without, but how something looks perhaps only bothers us humans, and we have to remember that we share these wild spaces with lots of other species. Judging from the photographs above, I think it looks rather good! Regardless of whether or not the wooden path adds or takes away from the visual element of the mountain, I feel the fact in this matter is purely practical. The boardwalk will preserve the surrounding environment for local wildlife such as birds, plants and insects and protect from further damage from walkers. A special thank you to Jonathan Frazer of www.stockfilmireland.com for allowing us to use his photographs. Bringing the Wild to You. I agree with you - conservation is important! In an ideal world there would be no need for any boardwalks, walkers would have no impact on the mountain environment, but in reality even walkers with the best intentions have an impact. On the 16th March 2016 I walked to the summit of Cuilcagh Mountain and was disappointed to find that many of the walkers, who I expect had come to appreciate nonhuman nature, left a great deal of litter behind them. Given this lack of awareness among a group of people one would have thought cared about protecting ecosystems what hope is there of humankind ever effectively addressing the host of environmental problems we created.